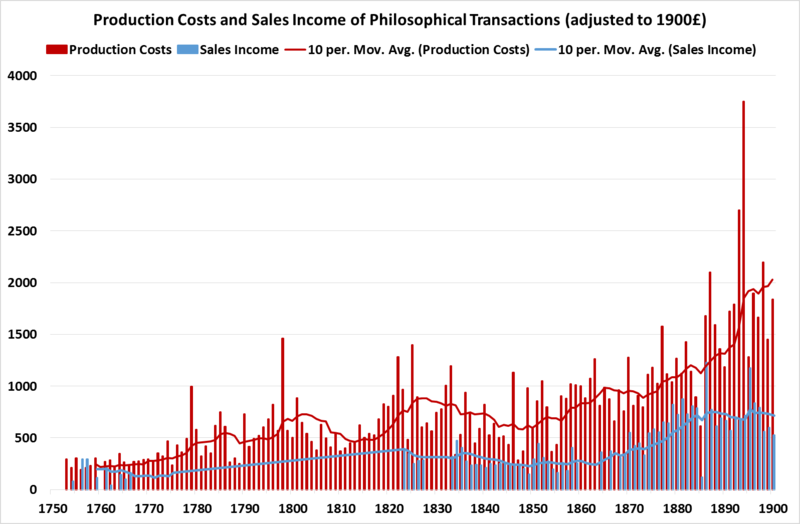 This graph shows as much information as we have about the Royal Society’s expenditure on publications, and income from sales of publications, from 1752 (when the Society took on the ownership of the Transactions) until 1920. The Treasurers of the Royal Society had a difficult task. They were charged with ensuring that the Society fulfilled its activities in a financially sustainable way. 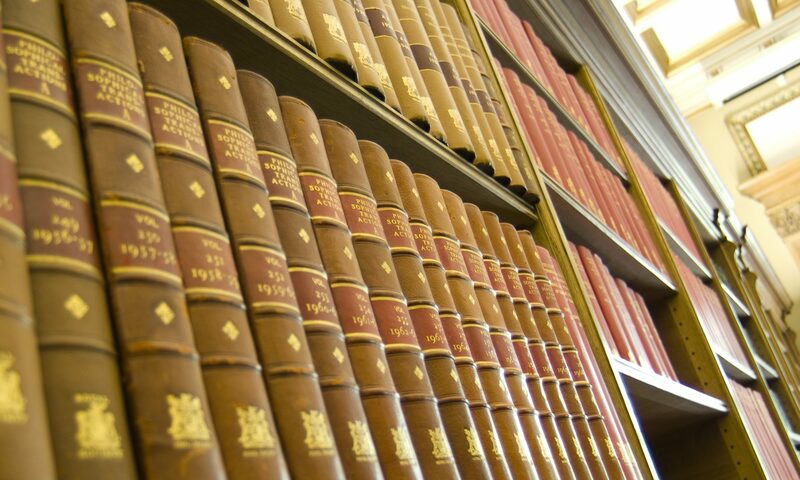 How the Society historically did this was to use any returns – largely in the form of grants, bequests, and stocks – to cover its costs, the greatest of which in the late nineteenth century was publishing. In this letter to the Council, the Treasurer (John Evans) sets out the ‘present financial position of the Royal Society with regard to its publications’. The Treasurer had worked out the average cost of publishing over six years preceding November 1892. He then laid out how the year succeeding this, 1893, had been incredibly expensive, the cost of publishing Transactions rising £850 above the average (of £2322) over the six years; the Society was able to cover the excess by using the sum recovered from Income Tax over-paid. The reason for the excess expenditure was that the average length of Transactions volumes and number of plates had almost doubled in 1893. In the current year (1894), based on the papers that had been accepted for publication to date, the cost of printing and illustrations was again estimated by the Treasurer to be considerably in excess (by £800) of what he believed the Society could comfortably afford ‘with any degree of safety’. 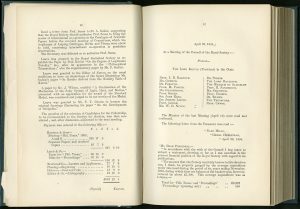 The Treasurer’s letter is significant because it highlights the Society’s continued struggle with the cost of publishing, which was rising; at the same time, the sale of Transactions stayed relatively constant. Thus the cost of publishing was not covered by income. On the contrary, the Society was continuously having to meet the publishing deficit using other funds. In his letter, the Treasurer believed cuts to the length of papers and illustrations, and stricter gate-keeping practices could curtail rising expenditure. In reality, the Society rather casually adopted some of his suggestions, including limiting Transactions papers to 40 pages, and trying to keep the cost of illustrations per paper below £35, but exceptions to the rule were always possible if the Committee of Papers approved. And it often did. The Society’s main agenda of disseminating scientific knowledge was not sympathetic to the need to make an income; in fact, it was almost hindered by it as the Society’s finances came to breaking point by the end of the nineteenth century. Despite the Treasurer’s suggestion, the Society never explicitly sent papers by non-Fellows automatically to referees. But the idea of encouraging referees to take seriously the need to reduce cost (by selecting some illustrations over others etc.) did become more prevalent later (see also 1907 Fellow’s memorandum on changing the Society’s publishing practices). Source: Council Meeting Papers/7: 26 April 1894, p 87-89, Royal Society Archives, London. 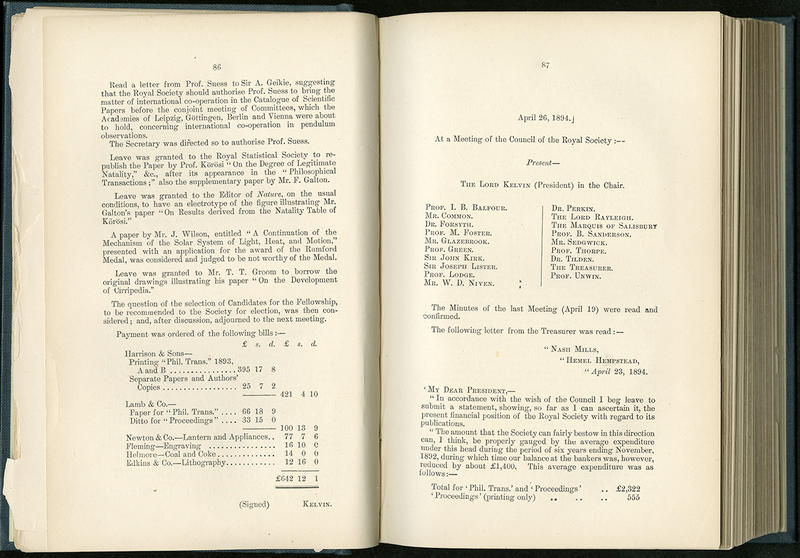 The publishing of the Royal Society’s Philosophical Transactions underwent considerable transformation in 1886 when a Publications Committee was appointed ‘to consider and report to the Council upon the mode and regulations of publication at present adopted by the Society, and what changes, if any, may be advantageously introduced’. The Society was facing increasing specialization in science and continued growth in submissions. The Committee consisted of the Officers of the Society (President, Secretaries, and Treasurer), as well as several past presidents. Advice was also garnered from the Presidents of the Linnean, Geological, Zoological, and Chemical Societies. Three months later, the Committee returned with recommendations. After months of discussion by the Council, they adopted several of its changes. The most significant was that the Transactions was to be split into two separate series, one physical (A) and one biological (B). The motivation was not stated, but it seemed that the Society was struggling to keep on top of the growth in submissions, and the increasing specialization of science. Splitting the journal made sense if the Society hoped to attract authors who were eager to publish in a more specialized journal. Yet, splitting in two still meant the Transactions maintained its relatively unique attraction as a general research journal. It also meant that Fellows could now receive one series of the journal depending on their research and interests. In fact, papers were from this date published separately (and only later in volumes), meaning that by the late nineteenth century the separate paper had surpassed the published volume to become the main mode of scientific communication. Source: Council Minute Papers/6: 2 February 1887, p123-124, Royal Society Archives, London.